Custom Website Design & Development | Anchor ‹A› Digital Design Co.
We’ll create a custom-designed WordPress website that wows; turning casual visitors into loyal customers. Your customers deserve to know within 5 seconds of visiting your website that they’ve landed in the right place. With an Anchor ‹A› custom-designed WordPress website, you’ll convert casual visitors into loyal customers that love your products/services as much as they love interacting with you in the digital. If you’re ready for a striking website that really makes them say “Wow”, you’ve come to the right place. Please inquire for special functionalities. This includes things like redirect interstitial (common for banks), locked content, site membership, opt-ins, email signup, etc. You’re launching a new business (or looking for a redesign of your existing website). You have developed offerings and a defined audience to sell them to. You believe in the power of what great design can do for your business. You’re ready to develop the necessary content that creates a valuable online experience for your visitors. You’ve been ready to stand apart from your competition. I currently build on WordPress because I believe it offers the most flexibility for my clients and can adapt to their future business needs. I talk more about that here: Why I Love WordPress and Recommend it For Your Website, Too. I’ve used other platforms as well and am more than happy to help you determine which platform is the best option for your needs. Do you do e-commerce sites? I do, however, we’ll definitely want to chat more about your project needs to make sure the solution I can offer is the right fit for your needs. Will I be able to easily update my website on my own? Yes! As long as you have internet access, you can make changes to your site on your own anytime or anywhere. After your website launches, we’ll complete a 60-min screencast training call where I’ll teach you how to make changes to your website. You’ll also receive a recording of the call so you can refer back to it later if you need to. What do I need to have ready before we start? Before we start, you’ll need to gather all your website content. This includes images, copy, etc. I’ve created a handy website content checklist to help you make sure you’re not forgetting anything important. I’m happy to help you plan your website content at an additional hourly rate. I don’t currently provide copywriting services for content development, but I can help you find a great copywriter who can help you with some custom wordsmithing! I require a 50% down payment before the project begins that also reserves your spot. Spots are reserved on a first come, first served basis. Do you offer retainer services? Absolutely. Contact me and let’s chat about your current design needs! Do you offer website maintenance or management packages? Yes, please check out my maintenance packages here. I just launched a new website, but why aren’t my sales increasing? Launching your website is just the first step. The next step is to drive traffic to your website and build a relationship with your audience. Check out the Zag blog for tips on marketing and driving traffic to your website. You might love this free resource I’ve created: 20 Ways to Market Your Business For Free. Please fill out the form below, and within 48 hours, you’ll get an email with an invitation to book a consultation call. Can’t wait to chat with you! I’m Amanda. 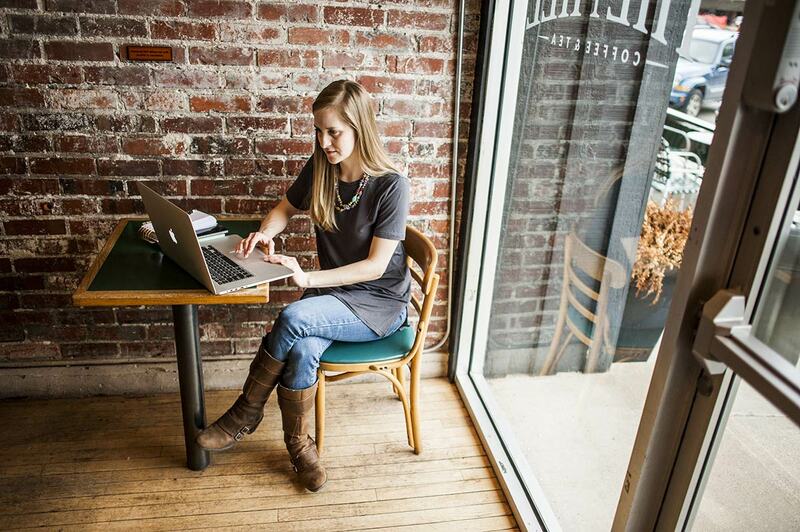 The Nebraska-based designer, front-end developer, and dreamer behind Anchor ‹A›. With 8+ years of design industry experience, I love empowering my fellow business owners with magnetic branding and striking web design. I do what I do because I know how powerful good design can be for a business. Think of some of your favorite websites to spend time on. Maybe you’ve even bookmarked them. I have some good news.. you can have a website like that too! Let’s get your website working for you, to help you meet your biggest goals.